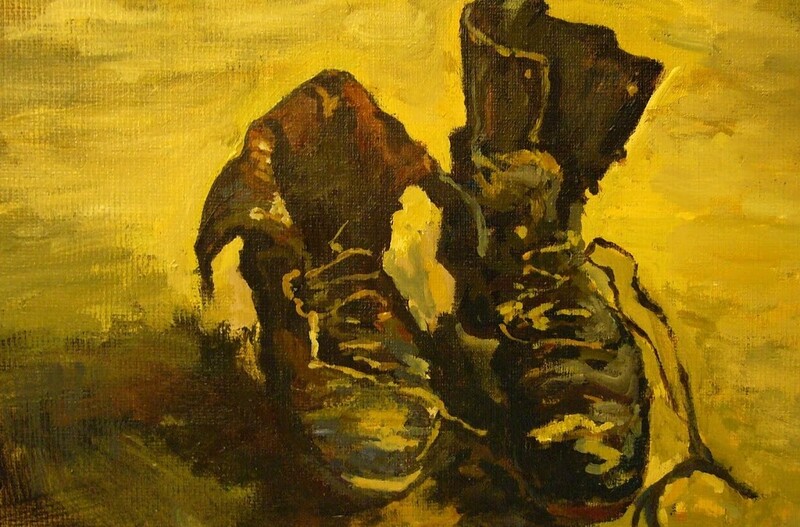 Where better to start ‘Travels with my Art’ than with Van Gogh’s boots? I know from experience how weary his feet must have been when he’d finished a day’s painting ‘en plein air’. The picture here shows a copy I made of Van Gogh’s original painting (from a postcard). I have just started painting in acrylics, after many years of watercolour as my main medium. Seeking inspiration one day, I saw the postcard on my wall, and made a copy. I did it in less than two hours, but am convinced that Van Gogh would have done it quicker. The brushtrokes are bold and quick, and I became bogged down in copying them all; he would have simply painted the boots. It gave me a good insight into his painting techniques.